In an article last month, I looked at a couple of my unsuccessful concoctions to see what went wrong. One deck I dissected was a Jeskai Aggro deck that used Honor of the Pure to get around Mantis Rider’s measly 3 toughness. My conclusion was that the deck would be better off with Mutagenic Growth and a more dedicated aggro plan. 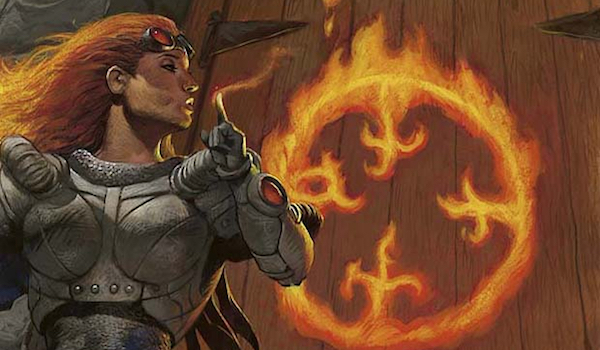 Eight days later, Jeff Hoogland’s own Jeskai Aggro deck was profiled on Star City Games. His adoption of the full four Mutagenic Growth and decision to compliment Rider with already-playable creatures that also benefited from the instant fell in line with how I had begun to feel about Mantis Rider decks in Modern. Jeff didn’t exactly set the world on fire with his performance at the Open, but seeing Mantis Rider get some love on the big stage still re-piqued my interest in the strategy. Today we’ll look at the tweaks I’ve been making to Jeskai Aggro over the last week and how they affect the deck. There are a couple things going on in the mainboard worth discussing. Prowess creatures. These creatures shoehorn Jeff into playing plenty of main-phase instants and sorceries, which make it difficult for him to pack any countermagic. He maxes out on Gitaxian Probe and Serum Visions, even including a pair of Twisted Image to push through extra damage with Stormchaser Mage. Notably, both Stormchaser and Monastery Swiftspear can be saved from Lightning Bolt by Mutagenic Growth. While these cards can be explosive with lots of zero-mana spells, I found in my testing that without free air to back them up, they often don’t cut it. Turn one Swiftspear into turn two Stormchaser isn’t much pressure when we don’t also have Gitaxian Probe, since the sequence doesn’t leave any mana open for Serum Visions, Lightning Bolt, etc. We don’t get to benefit from incidental prowess on that sequence (arguably the deck’s best opening) until turn three, which is pretty late in a turn-four format. Before then, Swiftspear and Stormchaser are likely hitting for one each. To sum up, there are three problems with leaning so heavily on prowess creatures: they limit our deckbuilding options by forcing us into lots of cheap instants and sorceries, they can be awkward with some draws, and they make for terrible topdecks. Besides, the idea is to run already-playable creatures that happen to benefit from Mutagenic Growth, and I’m not sure Stormchaser Mage has what it takes in Modern. No Delver. Delver of Secrets does a fine job of solving the issues presented by Stormchaser and Swiftspear. It’s vulnerable to Lightning Bolt before flipping, but survives it post-transformation with some help from a Mutagenic Growth. Since Delver costs half as much as Stormchaser, it seems like a straight upgrade to me. It provides more pressure without instants and sorceries, making it a better topdeck and allowing it to smooth out land-heavy hands (which are preferable in some matchups). Delver even smooths out land-light hands thanks to its low mana cost, something crucial for a deck on only 18. The main reason to play Delver in this deck: Jeff already runs 26 instants and sorceries, so the Human Insect is hugely reliable. A fastland manabase. Kudos to Jeff for being one of the first brewers in the format to experiment with fastland-heavy manabases. I think this is exactly the kind of deck that would want something like a playset of Spirebuff Canal. To address the problems with Jeff’s list, I turned to the best color in Magic. The three green cards that interested me most were Wild Nacatl, Noble Hierarch, and Tarmogoyf. Here’s how I feel about each card after testing them all. Noble Hierarch: Hierarch looks great on paper. She enables some of the deck’s best possible starts, such as Hierarch into Mantis to hit for four; smooths out our colors and helps us produce enough mana to cast our spells; makes our attackers more reasonable; and attracts Lightning Bolts we’d rather go to a mana dork than to a Mantis Rider. But the card underwhelmed in testing. While Noble Hierarch at one time or another did all the valiant things I listed above, she also had her not-so-noble moments. While attacking with a pair of threats (i.e. a Nacatl and a Rider) against opponents with no board (or ones with a board when we want to just go wide around them), Hierarch sits around like a dead fish. With Mutagenic Growth protecting our threats, It’s not uncommon for us to be attacking with two creatures by turn four. In those games, a turn-one Hierarch will have netted us 1-2 extra damage and 1-2 additional mana, which I’m not sure is worth it for the card investment. Consider that we could have led on Nacatl instead and broken even on the damage, making Nacatl something like a Rite of Flame in this scenario. That’s not even taking into account what happens if (God forbid) Hierarch comes down on turn two or later. The final strike against Hierarch is that we actually don’t need much extra mana. Acceleration is always nice at the beginning of the game, but considering how dead Hierarch is in the mid- and late-game, she’s just not worth it here. Once we get to four mana we’re set for the whole game, and we can operate off three lands without fear. If we’re struggling to make land drops, opponents will pick up on our strife and Bolt the Hierarch. While we generally like this to happen, we don’t when we are counting on Hierarch to let us cast our spells. Mana dorks in general come with a built-in punisher mechanic in this way, since opponents have the choice of shooting them or not and can decide based on how we play. Wild Nacatl: Nacatl is basically a strict upgrade to Monastery Swiftspear in this deck. It’s more reliably bigger and doesn’t force us to cast spells on our turn, allowing us to hold up interaction and pass the turn without feeling guilty. Since Nacatl comes down as a 2/2 on turn one, Growth saves him from Bolt right away. The Cat also plays fine defense, walling creatures like Goblin Guide and Snapcaster Mage. By abandoning Jeff’s fastland-heavy manabase, which we have to do anyway on four colors, Nacatl’s drawback becomes easy to get around. Tarmogoyf: Don’t act so surprised. Did you really expect me to play Stormchaser Mage over Tarmogoyf? Goyf plugs a crucial hole in this strategy by complimenting Mutagenic Growth. Sometimes, we don’t draw the instant, and in those cases, we need to have a backup plan when our one-drop gets Bolted. Goyf rewards us when opponents interact with our clock, which they must do to not die. It also rewards us for interacting with our opponents, which we must do to not die, and are built to do throughout the game. These factors combine to make Goyf a 4/5 or larger (we’ll get to that) in almost every game, and at once a more efficient attacker than Stormchaser and a behemoth on defense. I ran into a number of problems early in my testing and adjusted the deck accordingly. Seal of Fire and Traverse the Ulvenwald didn’t start in the mainboad, for example; I added them to clean up some of the issues I was having with Green Mantis. Durdling until turn three. As with most Mantis Rider decks I’ve experimented with, this one sometimes opens hands that don’t do anything until turn three. Openers like a Rider or two, a Lightning Helix, a Path to Exile, and some lands. We can’t realistically ship this hand in the dark, but we also can’t expect to pressure opponents until the mid-game with it. To be clear, plenty of decks in Modern (well, not that many) take a wholly interactive role early and don’t even try to pressure opponents until later in the game. We want to play Mantis Rider on turn three every game, which means tapping out. And even with Twin gone, tapping out that late is dangerous in Modern. Inkmoth Nexus, Kiln Fiend, Arcbound Ravager, and even Viscera Seer all make it a liability. I often wished I could spend my early mana on Bolts that I wouldn’t have to cast until later. You know, like Seal of Fire. .. Oh, yeah! 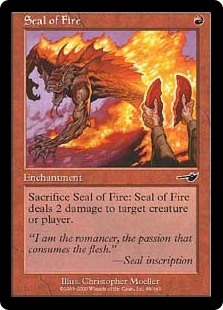 Seal of Fire! Seal allows us to do something with our mana early on in matchups where we want to save our Bolts for the face, threaten interaction for zero mana, set the pace of the game by forcing opponents to play around the burn effect, and pump Goyf by an extra level. Before Seal, I tried countermagic like Remand in its place. But Remand ran into the same problem as Bolt in turns one through three: sometimes it never did anything. If opponents weren’t casting spells, for instance. Hierarch was at its best when it traded for an opponent’s Lightning Bolt. I needed a card that would trade for an opponent’s card and mana in the first two turns without necessarily caring if they had cast any spells yet. Since I started playing Seal, the deck has felt much better. Struggling to land Bolt-proof Goyfs in a timely fashion. This was a smaller issue that I still ran into a couple times. Against opponents obviously holding a grip of Bolts, it’s unwise to slam Nacatl without some sort of protection. Tarmogoyf shines in this kind of situation. At least, as long as we can make him big enough. With just instants and lands in the graveyard, Goyf lacks Bolt protection. The set of Serum Visions was not enough sorceries, so I harkened back to my Counter-Cat philosophy and included a pair of Gitaxian Probe in the main. Struggling to make land drops against linear decks. With just 18 lands, it’s natural to struggle to find them sometimes. Against decks like Burn, though, not finding lands will just kill us. Very late in testing, I swapped the Probes for Traverse the Ulvenwald to help with this issue without lowering the number of power draws we had access to in longer games. The information was never that relevant for me in this deck and I often wanted a cantrip that always turned itself into something useful later, instead of always turning into a random card. Probe was also less important without prowess creatures. Traverse even fixes our colors when we need it to. Lacking threats against midrange decks in game one. This is less of an issue in game two, when we can bring in more burn spells. Jeff’s deck plays enough burn in the main not to encounter this problem at all. Traverse the Ulvenwald also mitigates this issue, since delirium is always live in the interactive mirror. Seal of Fire helps us achieve it otherwise. Lacking interaction for linear combo. Without Jeff’s heavier burn suite, I found I was often a turn slower than the linear combo decks of the format. Rather than run two more Lightning Helix in the main as he did, I opted to play a pair of Spell Pierce. Pierce is a hugely underrated card in Modern, stopping everything from Ad Nauseam to Through the Breach to Liliana of the Veil. It’s even fine to counter a Serum Visions sometimes, and hitting removal is always nice in a Mantis Rider deck. Nobody expects a counterspell at one mana, and we can afford to play some amount of countermagic without prowess creatures. On the other hand, Helix is something of a necessary evil in our mainboard, helping mitigate the amount of life lost from fetching, shocking, and Growthing. It’s awkward to cast with a Simic-colored land in play, and very clunky in some matchups, so I wouldn’t want to run four. I wrote an article a few months ago with tips on how to spot brews that are worse versions of existing decks, or of other brews. Thus the question at the forefront of my mind while testing Green Mantis: “Is this deck a worse Counter-Cat?” Mantis Rider offers some benefits over Delver and Mandrills, notably that it’s great at turning games around. But I don’t think that beats being able to put them away more quickly, and interacting more reliably with opponents while doing so. We can tweak a worse-version deck so that it’s doing something unique. Before I discovered Seal of Fire, Green Mantis was more obviously a worse Counter-Cat to me—we could just cut Mantis Rider for Delver and already have a more competent deck on our hands. But I managed to find a way to improve the deck while lowering the instant/sorcery count, making Delvers less reliable and giving us a hard reason to include Rider instead. Deckbuilding is a lot like puzzle solving. Too much permission makes us a worse Counter-Cat, too much reach makes us a worse Zoo, and too many creatures makes us a worse 5-Color Company. Striking the balance, and then testing to see if that balance is worth it at all, is the brewer’s unending mission. First off, big fan of your work. However I think you are missing what makes Jeff’s original deck relevant. The relatively painless manabase is huge. It leverages the new fastlands better than any other brew I’ve seen so far. This, in combination with four helix, gives him game against the aggro heavy meta of modern and allows him to play the 8 phyrexian spells easily. I think going four color and using the list you do causes two fatal flaws. A crazy damaging manabase that puts you behind in any racing situation, and using interaction that is frankly less relevant overall in the meta. There really are not a lot of decks that you need to fight on the stack anymore. They are either slower than you or not a big enough part of the format to warp a main deck around. I don’t think slowing yourself down is worth it. This is an aggro deck that packs lots of relevant interaction when needed but the big thing is that the spells can be proactive to just get them dead. It’s not a tempo deck. The bolts, helix, snag and snap in the jeskai deck fights the decks that can race you (infect, death’s shadow, burn etc) or just kill them when you don’t need to interact. Almost every draw is live. You can be straight up faster than the decks that you would want the counters for. Check out his testing videos. There are a lot of turn 4 wins with some turn threes sprinkled in as well. I have been testing the list as well and it has game against a ton of the field. The only matchup that is super rough is dredge. I think a few surgicals that can hit the enablers in narcomoeba and Bloodghast can really help out of the board however. Try it against the gauntlet. I think the deck is hitting a sweet spot in the meta right now. It seems pretty good against an open field. It can play the burn game against the controlling decks like jund and nahiri or just beat other things by racing or using the interaction to slow them down til they die. Side note: dismiss his later version he was testing with colonnades. He admits 18 land is one or two less than ideal, which I agree with, but using man lands that take five mana to activate in an aggro deck like this is really silly and frankly a bad idea. I think 19 lands with one twisted image is the build moving forward. The deck really want three lands on turn three and the fourth is often welcome as well. Add another scalding tarn and call it a day.